Seal of the United States Department of Commerce. The seal was approved on April 4, 1913 and is derived from the seal of the defunct United States Department of Commerce and Labor. It is composed of the arms (Per fesse azure and or, a ship in full sail on waves of the sea, in chief proper; and in base a lighthouse illumined proper), and crest ("The American Eagle displayed"). 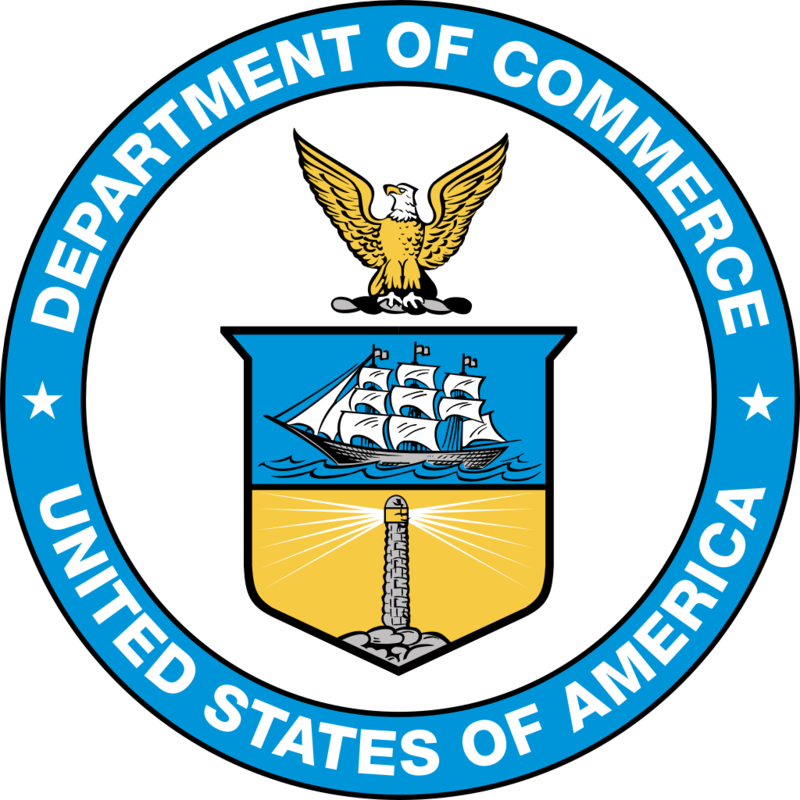 Around the arms, between two concentric circles, are the words "Department of Commerce" and "United States of America". The official symbolism has been modified as the functions of the department have changed. As of 2007: the ship is a symbol of commerce; the blue denotes uprightness and constancy; the lighthouse is a well-known symbol representing guidance from the darkness which is translated to commercial enlightenment; and the gold denotes purity. The crest is the American bald eagle denoting the national scope of the Department's activities. 来源 Extracted from the PDF document 2007 DOC Strategic Plan linked from this page. 作者 United States Department of Commerce. This work is a trademark of the U.S.Department of Commerce, and subject to trademark laws in one of more jurisdictions. Any unauthorized use of this work constitutes an infringement upon these trademark rights. Before using this content, please ensure that you have the right to use it under the laws which apply in the circumstances of your intended use. You are solely responsible for ensuring that you do not infringe someone else's trademark. See our general disclaimer The use of this trademark does not indicate endorsement of the holder by Wikimedia Commons or the Wikimedia Foundation, nor vice versa. This is an informational tag and not a license tag. A normal copyright tag is required as well. Bitmap version; some elements use different colors. This image or file is a work of a United States Department of Commerce employee, taken or made as part of that person's official duties. As a work of the U.S. federal government, the image is in the public domain. This was produced by version 4.1 of GNU libplot, a free library for exporting 2-D vector graphics.